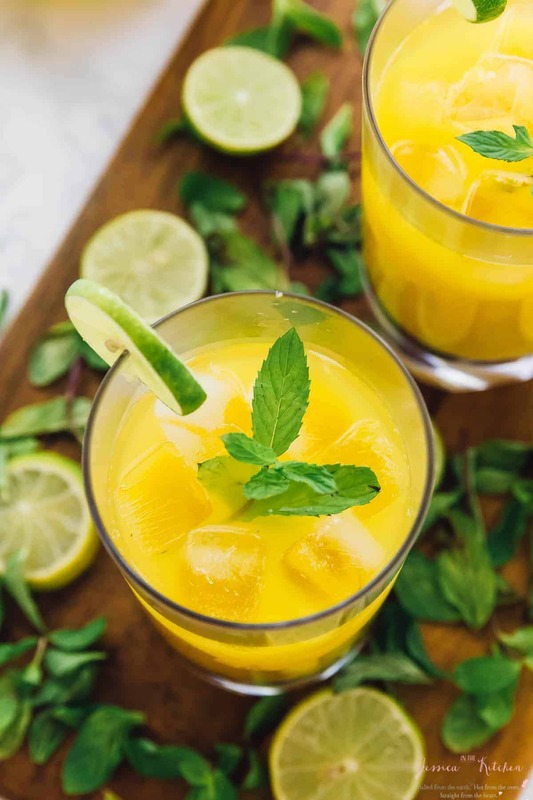 These Mango Mojitos are so easy to make – in your blender! Only 6 ingredients, they’re perfect for parties, get togethers and barbecues! Summer is almost over!! What better to positively end it than with a delicious fruity drink? These Mango Mojitos are soooo darn good. Mango + mint + lime = a magical combination. This recipe make enough for you and your friends, and can be made ahead of time. Trust me, you’ll want to make this over and over this summer. So, remember these Watermelon Mojitos ? You all loved them, so I knew I needed to come back with another fruity mojito recipe for this summer. 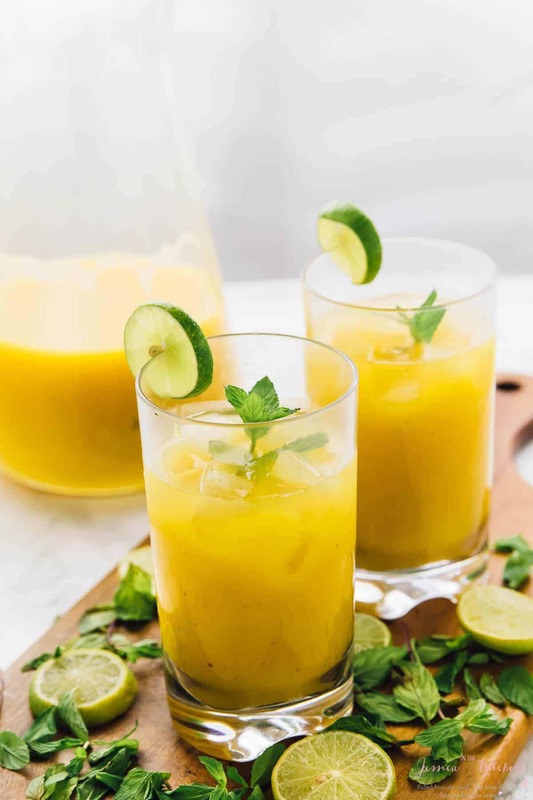 We’ve had so many mangoes this spring and summer, so these mango mojitos were a complete no brainer. I wanted you to get a nice hint of the mango without it being a super thick smoothie, so the seltzer water plays an important role in making this drink. Let’s talk about this flavour, though friends. Undeniably delicious. The mango of course, not only adds sweetness, but this stunningly beautiful colour to these Mango Mojitos. The mint flavour is pretty subtle, but adds a delicious flavour profile also. The lime of course, balances it all out. 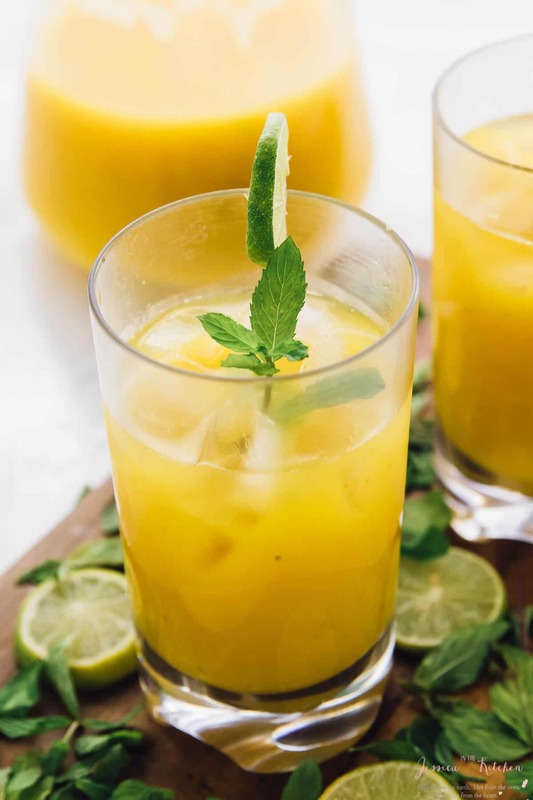 Even though the mangoes are sweet, because of the amount of seltzer water I added, you’ll need some simple syrup to bring back up the sweetness of this drink. What you get is a beautiful, tasty and totally easy cocktail drink for the summer. Yes, easy. You literally blend up most of this drink in your blender, stir in the rum and simple syrup, and then pour it over a glass filled with ice when serving. I love serving it with a little lime wedge and some mint on top for gorgeous garnish presentation and even more of a tiny kick. If you’re feeling SPICY, rubbing the rim of the glass with cayenne pepper is SO divine too. 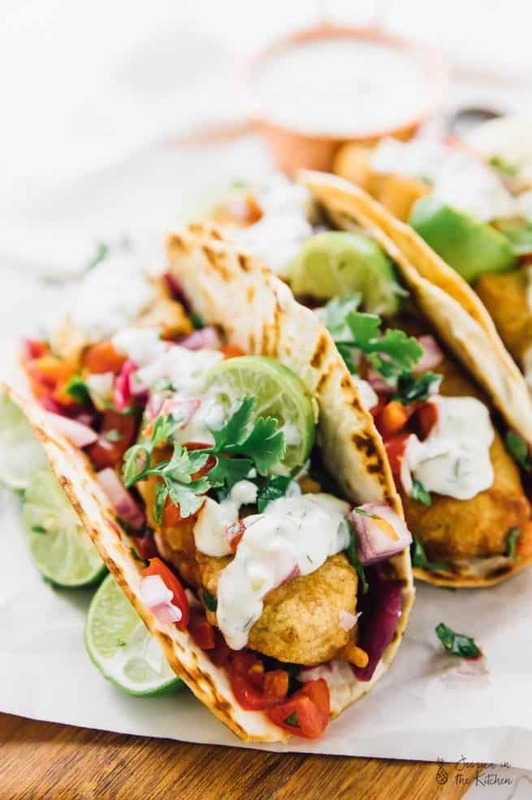 It’s something we tried in Mexico and absolutely loved it. Enjoy friends! 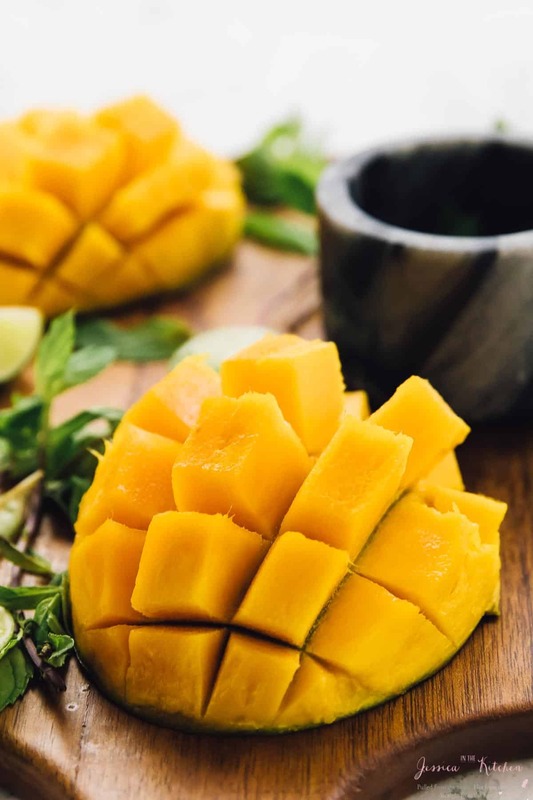 Add your mango cubes and mint to a food processor or high speed blender until smooth, about 30 seconds to 1 minute in the food processor or in the blender until a smooth puree forms. Add in the seltzer water and lime juice and mix again, for up to 10 seconds to combine. Pour the mango mixture into a large pitcher and add in the white rum. Stir vigorously for about 15-30 seconds to incorporate. Taste and add the appropriate amount of simple syrup based on the sweetness of your mangoes, up to 1 cup simple syrup, and stir again. I’ve used both a Jamaican Appleton White Rum and a Brazilian White Rum, so any white rum should be fine! The best kind of mangoes to use are the ones without stringiness. 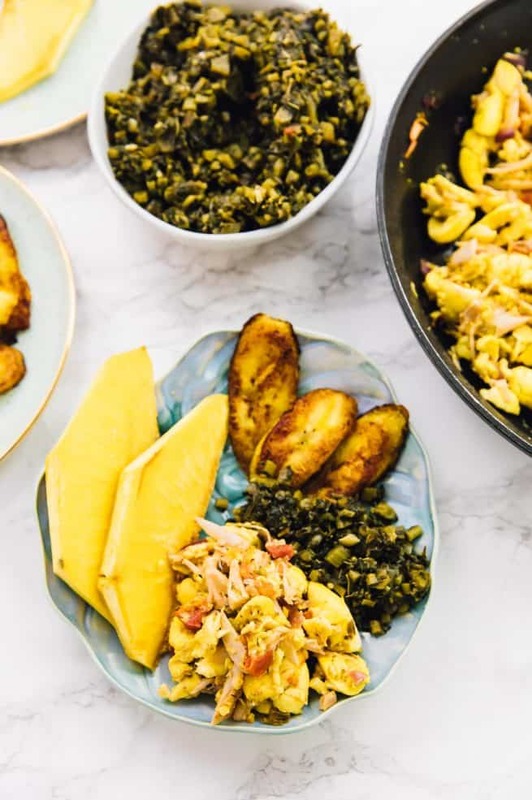 Julie mangoes would be your best bet. If you’re not sure which is a Julie mango, ask your local grocer/vendor and they’ll guide you in the right direction. You can make the simple syrup by boiling 1 cup sugar with 1 cup water until completely liquid, stirring often. Cool it down, then measure it out! This makes a bit more than 1 cup simple syrup, so use as much or as little of it as you want depending on the sweetness of your mangoes. *seltzer water/club soda/sparkling water – you can use any of these but sparkling water is the most natural (and expensive) of them all, then seltzer water, then club soda which has a few additives. 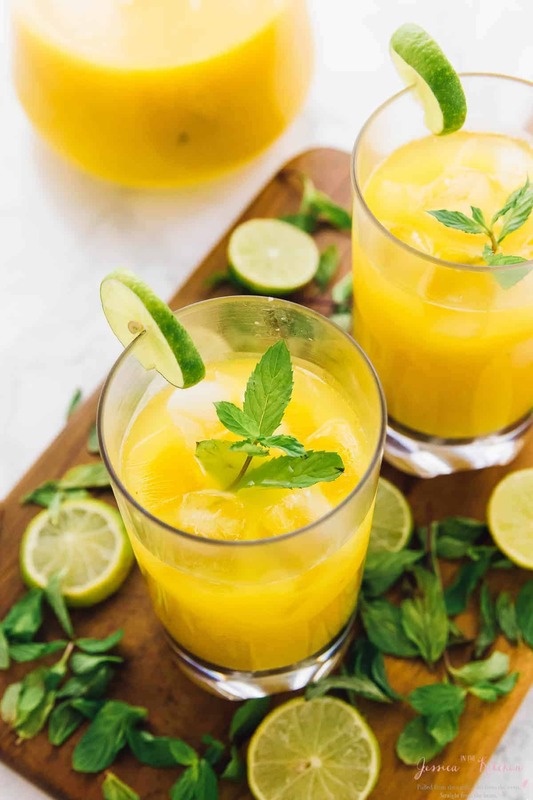 If you try these Mango Mojitos please let me know in the comment section below, or tag me on instagram with the hashtag #jessicainthekitchen! For more exclusive recipes follow me on Instagram AND on Snapchat: jessinkitchen. Perfect, esp. now mango is in season! 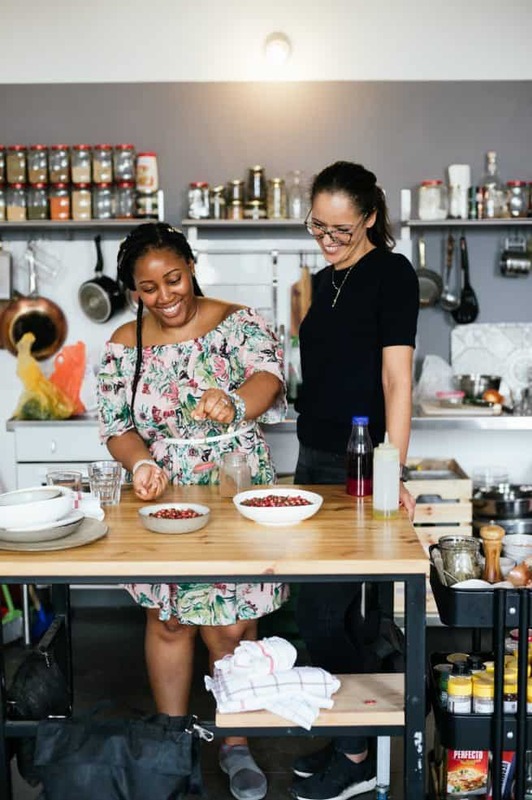 Hi how many serves are in this recipe? I need to make these in a few days time for 22 people! Hoping you can respond ASAP! I would say about 4-5 people if you’re doing 2 ounces rum per person! I hope you enjoy!! What exactly is simple syrup? Thanks Johane! I hope you and your family enjoy it! Thanks for your kind words!